Data recording and real time vibration analysis instrument can be used in industries with harsh or rugged environments. 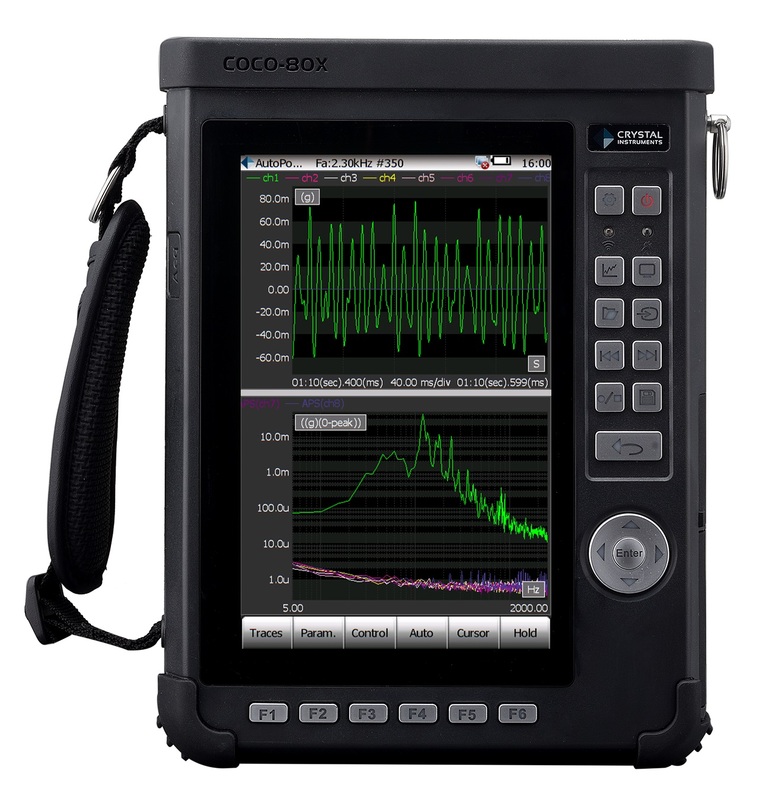 AcSoft Sound & Vibration has launched a handheld signal analyser from California-based Crystal Instruments. The new CoCo-80X is the latest touchscreen system for quick, easy and accurate data recording and analysis for the automotive, aerospace, aviation and military industries. Capable of real time processing in the field, the rugged CoCo-80X is a lightweight, battery-powered handheld instrument with unparalleled performance and accuracy. Combined with hard keys, the multi-point touch functionality touchscreen is designed for an intuitive user interface that provides a wide variety of analysis capabilities. The CoCo-80X also has an impressive range of connectivity choices including USB 2.0, 100Base-T Ethernet, 802.11 b/g/n Wi-Fi, SD card, HDMI, CAN-Bus/serial port, stereo headphone, microphone jack and GPS. Available with 2, 4, 6 or 8 channels, each analogue input is serviced by two 24-bit ADCs and a DSP implementing patented cross-path calibration technology to achieve better than 150 dBFS dynamic range. Measured time histories are stored in 32-bit single precision floating point format (per IEEE 754-2008) and all subsequent signal processing is performed using floating-point arithmetic. It offers 54 sample rates from 0.48 Hz to 102.4 Hz are provided with better than 150 dB of alias-free data from DC to 45% of any selected sample rate protected by sleep 160 dB/Octave anti-aliasing filters. All channels are amplitude matched within 0.1 dB and phase matched within 1ᵒ. AcSoft provides a range of options for Modal Analysis from data collection to software analysis. As well as the new CoCo-80X advanced signal analyser, the company offers the Spider 20, a four-channel data recorder for users who require a more compact solution that can communicate via its built-in Wi-Fi interface, allowing the use of an iPad to setup, view or record time histories. It can also perform spectrum analysis or measure frequency response and coherence functions. AcSoft offers software packages for a variety of modal analysis applications including operating deflection shape (ODS) for the visualisation of the vibration pattern of a component or structure.